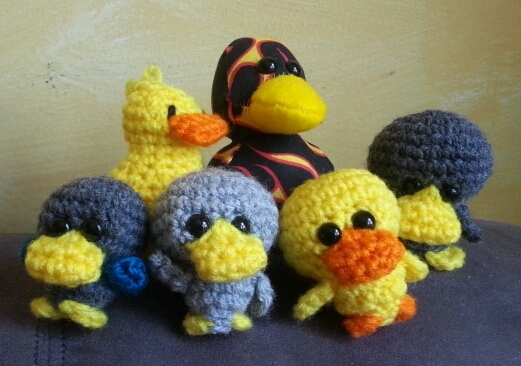 A Lil’ Duck, handsewn duck, 3 Ultra Mini Uglies (pattern coming later this weekend), and a Lil Ugly about to fly away. They’ll all be released at the Sheep to Shawl Festival at Philipsburg Manor in Sleepy Hollow, NY as soon as they put on their Little Yellow Duck tags. How could they not be released at an event that features sheep shearing, yarn spinning, AND duck herding!